Thorlabs' compact 532 nm Diode-Pumped Solid State (DPSS) green laser modules are a combination of Nd:YVO4 and KTP crystals pumped by an 808 nm laser diode. The front window consists of a wedged glass filter, which blocks the IR source light and hermetically seals the module. DPSS lasers can be used like any typical semiconductor laser diode, but offer a much smaller beam divergence. The polarization of the DJ532-10 laser is perpendicular to the line made by pins 1 and 3 (see pin diagrams below) while the DJ532-40 laser has a polarization that is parallel to this same line. DPSS lasers are intended for CW operation and should not be pulsed. These lasers are compatible with our LDM56 temperature-controlled laser diode mount using the LDM56DJ mounting flange (sold below). The Ø2.0 mm pin spacing on the rear is identical to our Ø5.6 mm laser diodes. Efficiency is reduced outside of the operating temperature range (20 to 25 °C) as a result of the temperature sensitivity of the laser crystals. In the absence of a regulated heat sink, the pump laser current is enough to heat the laser far above 25 °C. These lasers can be used with any of our M9-threaded aspheric lens adapters if the temperature of the DPSS laser is controlled. Compatibility with our wide range of SM1-threaded (1.035"-40) components is possible using our S1TM09 adapter. The unthreaded portion of the housing can also be secured inside our AD9.5F Collimator Adapter. When mounting these lasers, it should be noted that there is an X-Y position offset between the pins and the emitted beam. These lasers are manufactured such that the emitted beam is concentric with respect to the housing. If mounting by the pins instead of the M9-threaded front face, the emitted beam will be slightly off-centered from the mount. Please contact Tech Support for more details. For best results, please follow all typical laser diode handling procedures. Please note that the DJ532-10 (10 mW) monitor current only represents the power of the IR pump laser and not the output of the green DPSS laser. For this reason, we recommend using the DJ532-10 with a constant current laser diode driver. The DJ532-40 does not contain a monitor photodiode. Hi, I am also interested in the spectrum of DJ532-40 diode lasers and the coherence length. Could you please send me the same information you sent to jxxu (posted 2019-02-21 09:51:02.0). Thank you! Thank you for your feedback. I have reached out to you directly. Hi, Do you have the spectrum of DJ532-40 diode lasers? I want to know the FWHM of the longitudinal mode and the coherence length of the laser. Thanks! Hello, thank you for contacting Thorlabs. Measuring the DJ532-10 (200mA, 25C) with our SA200 Scanning Fabry Perot Interferometer we calculated a linewidth of ~10.9MHz which translates to a coherence length of ~27.5m. Following a similar procedure with the DJ532-40 (330mA, 24C) we calculated ~30MHz linewidth for a coherence length of ~10m. Can you give any details of the residual IR (specifically 1064, but also 808) emitted from the device? We would actually want to use the 1064 as a seed in a DFM stage, so are hoping there could still be a small but usable level transmitted. Hello, thank you for contacting Thorlabs. The IR leakage at 808nm and 1064nm is on the order of ~1.0 uW each, depending on the variant of the DJ532 model, though this is not something we specify. I will reach out to you directly with more information on how the test was conducted. 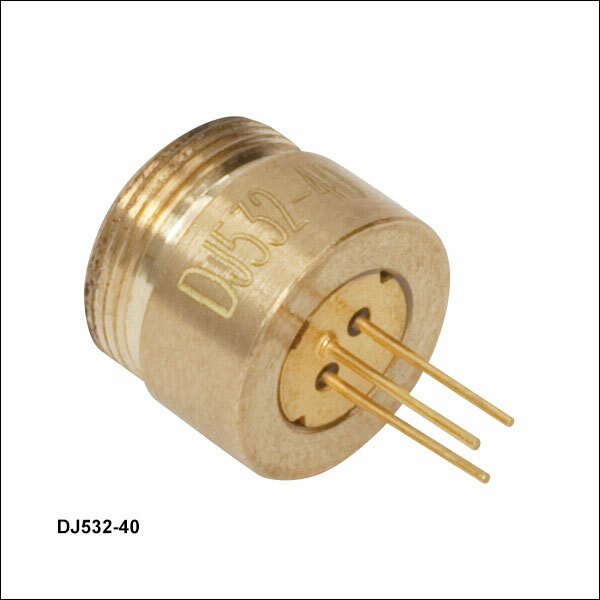 Is the laser diode controller TLD001 compatible with the DPSS laser DJ532-40? Thanks. Hello, we do not recommend the TLD001 for the DJ532-40 since the driver maxes out at an output current of 200mA. This diode, however, has a typical operating current of 330mA (400mA max). Thus, we recommend the LDC205C instead. Response from Yashasvi at Thorlabs USA: Hello, thank you for contacting Thorlabs. The beam size is around Ø50µm at the output face of the crystal in the DPSS. The divergence is typically around 12 mrad (could be as high as 15 mrad) from that point on. We have seen very low divergences (less than 5 mrad) as well. Given that the divergences can be very low, placing a short focal length lens can result in the beam being focused to a spot. Keeping this in mind, for general use, we do not recommend the use of collimation optics. If necessary, you could look into using long focal length aspheric lenses. We have a tutorial for picking an appropriate lens for single mode laser diode collimation here: https://www.thorlabs.com/newgrouppage9.cfm?objectgroup_id=1832&tabname=LD%20Collimation. The typical Optical Power vs Drive Current plot can be found on the spec sheet available on the website. Please note that we do not recommend this diode for pulsed operation. What is M^2 and ellipticity of the dpss laser 10 mw? Hello, thank you for contacting Thorlabs. Unfortunately, we do not test individual units for their M^2 and ellipticity, so we don't really have a spec for this. That being said, in subjective terms, the beam is quite circular. I will reach out to you directly with the data we do have regarding this. What is the typical polarization extinction ratio of the 532 nm DJ532-10 DPSS laser? Response from Bweh at Thorlabs USA: Though the pump and second harmonic generation process that generates the output are highly polarized in nature, the measured linear PER is only in the 5-10dB possibly due to some ellipticity that is introduced prior to the output. Response from Bweh at Thorlabs USA. We don't have a typical noise data (amplitude or frequency) at this time. When using this, remember that it is a diode pumped laser with a frequency doubling crystal and the nonlinear effect is sensitive to temperature so besides using a very stable current source, the operating temperature should also be optimized within the specified range for single mode operation. I would be really excited if you had a DPSS module such as this WITHOUT the KTP crystal. Any chance of getting one of those? Response from Jeremy at Thorlabs: This is not a module we have. I will contact you directly regarding the possibility of getting this. Hi Jeremy: "The polarization direction of DJ532-40 is parallel to the line made by pins 1 and 3. " Are you sure? I checked with mine and found that it's ~40 degrees from the pin1-3 direction (horizontal of TCLDM9). Am I doing something wrong? Response from Jeremy at Thorlabs: Since you did not leave your contact info, please contact us at techsupport@thorlabs.com and we will troubleshoot this issue. Thanks. What is the polarization axis with respect to the packaging pin layout? Response from Jeremy at Thorlabs: The polarization direction of DJ532-40 is parallel to the line made by pins 1 and 3. For the DJ532-10, it is perpendicular to the line made by pins 1 and 3. After using DJ532-40 round half a year it getting hard to obtain TEM00 mode. Some time ago it helped to change the temperature, or to play with a current, but now I have no more ideas.. Laser is mounted in TCLDM9. Could you give an advice? Or should we buy a new one? Response from Jeremy at Thorlabs: The typical lifetime for the DJ532-40 is around 5000 hours or so. We will get in contact with you directly to discuss about your DJ532-40. I am interested in modulating this laser at about 400 Hz. I saw the comment posted below about crystal state lifetimes being a limitation, but there was no further information. Also, can this laser be fiber-coupled? Response from Jeremy at Thorlabs: For the DJ532 series, we do not recommend modulating this (only use as a CW source). The reason for this is because one cannot get clean output signal if modulated. For example, within a 5ms pulse, the output is quite noisy and erratic. Also, the output is non-linear (because of the non-linear crystal in the DPSS). You could possibly fiber couple this with the right optics and mount. Response from Tim at Thorlabs: This is correct. The LDM9T and LDM21 use a flange for the mount’s taps with a center distance of 20.32mm as opposed to the TCLDM9’s 19.05mm. We chose to introduce a flange for this mount as testing on the TCLDM9 with the DJ532 series showed it was able to dissipate the heat generated by the DPSS. 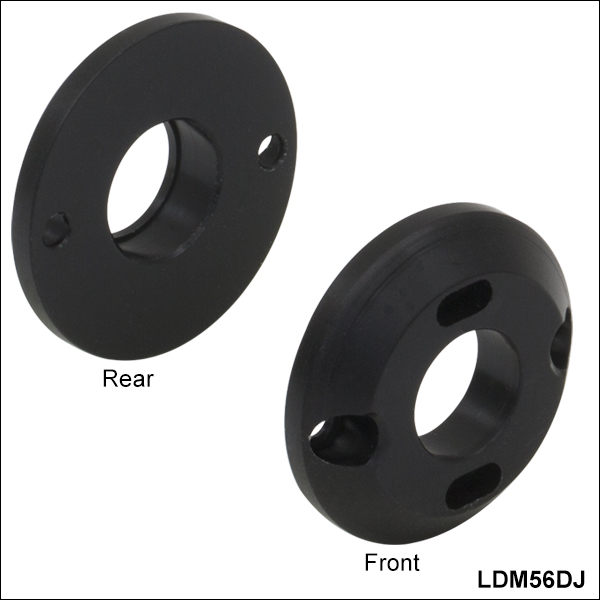 The TCLDM9DJ mounting flange for LD DJ532-10 does not fit the LDM9T mount: the distance between mounting screws needs to be 20mm, but are 19mm. Response from Jeremy at Thorlabs: The linewidth for the DJ532-40 should be around 30MHz. Response from Jeremy at Thorlabs: The photocurrent from the monitor photodiode only represents the power of the 808nm pump laser diode and is not indicative of the optical power output of the 532nm laser. Typically, the DJ532 is used with a constant current source. For example, for an OEM solution, you could use the LD1255R (http://www.thorlabs.com/NewGroupPage9.cfm?objectgroup_id=1366&pn=LD1255R). Response from Sean at Thorlabs to busco: Thank you for your feedback. You are indeed correct, the vaule for P0 in the Operating Current and Operating voltage entries on the spec sheet and web spec table for the DJ532-40 should be 40 mW. We are correcting this error and the spec sheet and website should be updated soon. There is a small mistake in a spec sheet for DJ532-40: "Operating Current @ P0 = 10 mW*. " Should be 40 mW. Update from Tim at Thorlabs: The beam waist is about 50um located at the surface of the crystal. After testing two DJ532-10 units, the output is elliptically polarized and both units have PER (the power ratio between the max power axis and min power axis) between 13dB to 14dB. Measuring the DJ532-10 (200mA, 25C) with our SA200 Scanning Fabry Perot Interferometer we calculated a linewidth of ~10.9MHz which translates to a coherence length of ~27.5m. Following a similar procedure with the DJ532-40 (330mA, 24C) we calculated ~30MHz linewidth for a coherence length of ~10m. Thank you for your interest in these DPSS laser diodes. We are continuing to characterize these and will update the web presentation with more information. Response from Tim at Thorlabs: Thank you all for your feedback. We are working to update the web presentation in the near future to provide more information. For your immediate needs I will compile this data and update you shortly. What is the polarization state of the laser beam from this DJ532 laser? Response from Tim at Thorlabs: Thank you for your feedback! There are a few things that may alter the performance of the DPSS when modulating the pump diode. Because the DJ532 has a laser diode which pumps a crystal, the lifetime of the energy states of the crystal will likely limit modulation speed. Also, the response is highly non-linear which will cause uneven pulses. I will contact you to continue this discussion. Could this laser be modulated by the current modulation (for example with pulse-peaker and TCLDM9 mount) or it is mostly designed for CW usage? May I know the output beam diameter of this LD? Thanks. What is the coherence length of this laser diode? Response from Buki at Thorlabs: Thank you for your feedback. The beam diameter is about 60um (FWHM) at the crystal surface which is about 1.35mm inside the device’s front window. We are currently revising the specification sheet for this laser in order to provide more information. Please contact TechSupport@thorlabs.com if you have additional questions. What are the beam diameters (FWHM) for your DPSS laser modules? As the divergence is so small that becomes quite important. Response from Buki at Thorlabs: I would like to correct my former response. While the pin out of the DPSS laser is compatible with our temperature controlled mounts, we do not currently have a mounting flange designed to hold the DPSS laser in our temperature controlled mounts. We are working on making the mounting flange available soon. As a temporary solution, we can provide a custom mounting flange. Please contact TechSupport@thorlabs.com if you have any questions. Response from Buki at Thorlabs: Thank you for your feedback. The DPSS lasers are compatible with our TCLDM9 temperature controlled mount. Please contact TechSupport@thorlabs.com if you have additional questions. Is the DPSS laser compatible with your TCLDM9 or other LD mount in "Related Products" linked above? Response from Buki at Thorlabs: We have visible collimated laser modules that may be better suited to your alignment needs. Please use the link below to get more information: http://www.thorlabs.com/NewGroupPage9.cfm?ObjectGroup_ID=1487&pn=CPS532#368 The DJ532-10 is a bare diode that will require a laser driver as well as a lens to get a collimated beam. We have contacted you to discuss your application and assist you in selecting the appropriate products. Would this laser (DJ532-10) be suitable as an alignment laser for a telescope? (It would need to be visible at a distance of about 50 m, and attenuated for safety.) Does it require a specific power supply? Can it be operated from a battery? The monitor photodiode of the DJ532-10 measures the power of the pump source, not the 532 nm output. Therefore, we recommend using these lasers with constant current diode controllers. 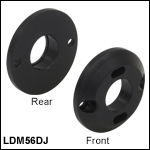 The LDM56DJ mounting flange is used to secure a 532 nm DPSS laser to the LDM56(/M) temperature-controlled laser diode mount. To use, mount either the DJ532-10 or the DJ532-40 laser in the LDM56(/M) mount. Using the two 2-56 x 3/8" cap head screws provided with the flange, or with the mount itself, attach the flange to the mount. Please note: this flange is sold separately from the LDM56(/M) Temperature Controlled Laser Diode Mount.